Wrapped around the brick that smashed the door of Democratic party headquarters in Rochester, New York, a note with the Barry Goldwater quote: ‘Extremism in defense of liberty is no vice.’ On Twitter, former Alaska Governor Sarah Palin told followers, ‘Don't retreat, reload.’ While an Alabama man advocated armed uprising....At a conservative Tea Party protest at the Capitol this weekend, some demonstrators hurled racially and sexually-charged insults at members of the Congress. A demonization effort made possible thanks to the full cooperation of the network newscasts. 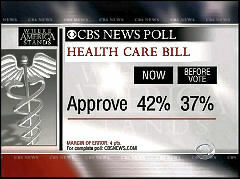 Unmentioned by Reid and not displayed in the on-screen graphic: more are still opposed with disapproval at 46 percent. 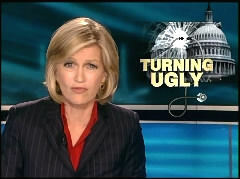 DIANE SAWYER, IN OPENING TEASER: Tonight on World News, sound and fury: Opposition to health care turns menacing. Members of Congress get extra security. Who is behind this? SAWYER: Good evening. We learned today that extra security was called in for some of those members of Congress who voted yes on health care reform. It turns out angry opponents of the bill unleashed threatening phone calls, scathing words, even bricks thrown through windows. And Jon Karl has been following it all from Capitol Hill. What's this about, Jon? JONATHAN KARL: Well, Diane, the incidents are relatively small and isolated, but they have captured the attention of congressional leaders and law enforcement. Shattered glass in the offices of Arizona's Gabrielle Giffords, death threats directed at Congressman Bart Stupak – in the mail and over the phone. AUDIO CLIP OF PHONE CALL: You turncoat son of a (BLEEP). I hope you die. KARL: And attacks on local Democratic party offices in Wichita, Kansas, and Monroe County, New York. That one included a quote from former Republican presidential candidate Barry Goldwater: “Extremism in defense of liberty is no vice.” House Democratic leaders are suggesting some of the blame for all of this may lie in overheated Republican rhetoric. HOYER CLIP #2: -or they put a target on their faces, with cross hairs, that activity ought to be unacceptable in our democracy. KARL: He's referring to this from Republican Party Chairman Michael Steele. MICHAEL STEELE, RNC CHAIRMAN: This November, they're going to pay, so let's start getting nasty, ready for the firing line this November. 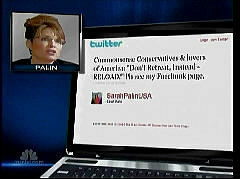 KARL: And this from Sarah Palin, a message via Twitter: “Common sense conservatives and lovers of America, don't retreat. Instead, reload.” On her Facebook page, cross hairs mark the districts of 17 Democratic lawmakers she wants to see defeated in November. Today, some Republican leaders condemned the violence. JOHN BOEHNER, HOUSE MINORITY LEADER: Violence and threats are unacceptable. It is not the American way. Yes, I know there's anger, but let's take that anger and go out and register people to vote, go volunteer on a political campaign, and let's do it the right way. KARL: The Democratic National Committee is publicizing the incidents and even using them to raise money. 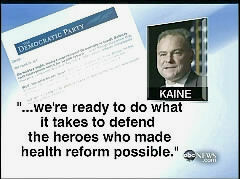 This fundraising pitch from Democratic Chairman Tim Kaine, vowing, “We're ready to do what it takes to defend the heroes who made health reform possible.” Just send your checks to the DNC. RICK KLEIN, ABC NEWS SENIOR POLITICAL REPORTER: Democrats are looking to build some momentum out of this, and if they can demonize the other side, then I think it's only to their political benefit. MAGGIE RODRIGUEZ, IN OPENING TEASER: Tonight, uncivil discourse. 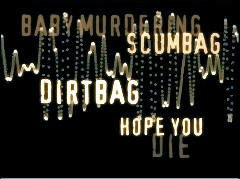 UNIDENTIFIED MALE VOICE #1: Baby-murdering scumbag. UNIDENTIFIED FEMALE VOICE #1: You are a dirtbag. UNIDENTIFIED MALE VOICE #2: I hope you die. RODRIGUEZ: And threats of violence against Democrats who voted for health care reform, even as public support for the plan is growing. RODRIGUEZ: Good evening. Katie is off tonight. Since the passage of health care reform, more Americans are telling us they approve it. We'll have the latest on our latest CBS News poll in a moment. But first, some opponents of reform are making their feelings known in a very ugly way, phoning anonymous threats to members of the House who voted for it and vandalizing their offices, like Congresswoman Gabrielle Giffords in Tucson, Arizona. Congressional correspondent Nancy Cordes is on Capitol Hill tonight. Nancy, law enforcement is taking these threats very seriously. NANCY CORDES: That's right, Maggie. The FBI is even investigating, and Democratic leaders tell us at least 10 of their members have received serious threats. UNIDENTIFIED FEMALE VOICE #2: You will rue the day you did this, Mr. Stupak. CORDES: Death threats from pro-life callers started pouring into the office of Michigan's Bart Stupak as soon as the anti-abortion rights Democrat announced he'd vote yes. UNIDENTIFIED FEMALE VOICE #3: There are millions of people across the country who wish you ill. UNIDENTIFIED MALE VOICE #3: You’re a cowardly punk, Stupak. That's what you are. You and your family are scum! CORDES: Democrat Louise Slaughter received one call threatening to, quote, "kill the children” of the members who voted yes. Her headquarters in Niagra Falls, New York, is one of four Democratic offices around the country that have been vandalized. Among them, the Tucson, Arizona, headquarters for Congressman Gabrielle Giffords, where windows were smashed. REP. GABRIELLE GIFFORDS (D-AZ): We've got to take a time out, folks. We've gone too far in certain areas, and this should not be tolerated. 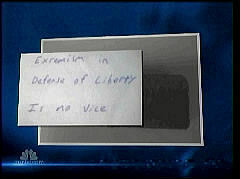 CORDES: Democrats accuse their GOP colleagues of inciting such acts with inflammatory rhetoric. Like Texas Republican Randy Neugerbauer's outburst on the House floor Sunday night. REP. RANDY NEUGEBAUER (R-TX): Baby killer! CORDES: Shouting "baby killer" when Congressman Stupak was speaking. JIM CLYBURN, HOUSE MAJORITY WHIP: The vast majority of the American people look to us to provide the manner in which differences in our society ought to be resolved. CORDES: Neugebauer apologized to Stupak, but seems far from contrite in a new campaign web ad. NEUGEBAUER: I spoke very passionately because I believed what was going on was not right for America. You know what? I'm never going to quit speaking on behalf of the unborn. 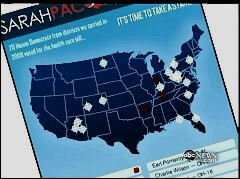 CORDES: Democrats complain Sarah Palin is also using violent words and imagery. On Twitter, she urges conservatives: “Don't retreat. Instead, reload.” And the Web site of her political action committee posts bull's-eyes on districts of vulnerable Democrats. A pair of Tea Party activists in Virginia posted what they thought was Congressman Tom Perriello's home address urging opponents of the health care bill to, quote, "drop by” to provide a “personal touch” to their disappointment in his yes vote. The home, it turns out, belonged to Perriello's brother. Now police are investigating a severed gas line to his propane grill. Republican House Leader John Boehner released this statement condemning such behavior. Quote, "I know many Americans are angry over this health care bill and that Washington Democrats just aren't listening, but, as I've said, violence and threats are unacceptable.” It's in this tense atmosphere that the Senate continued to debate a major set of Democratic changes to the new health care law today. SENATOR JOHN MCCAIN (R-AZ): You can put lipstick on a pig, Mr. President, but this is still a pig. CORDES: Republicans introduced 23 amendments that they said were designed to improve the health care bill, and Democrats said were designed to derail it. HARRY REID, SENATE MAJORITY LEADER: How serious could they be? Offering an amendment out here on gay marriage in the District of Columbia? How serious could they be offering an amendment dealing with Viagra for rapists? CORDES: And now Senators have wrapped up that debate. They'll start voting on all those amendments all night long. Democrats have vowed to vote against all of them. Maggie? RODRIGUEZ: Nancy, you've been on the Capitol all day. What are members telling you about these threats? CORDES: Well, some Democrats, frankly, Maggie, have told us they are afraid especially because this batch of threats appears to be directed not just at them but at their families as well. And that's unusual. They feel frustrated that their Republican colleagues haven't come out more forcefully against this kind of behavior. But Republicans have told us, look, this is very unfortunate, but it's a fact of life here on Capitol Hill, when you take a controversial vote like this there are going to be threats. RODRIGUEZ: Nancy Cordes on Capitol Hill. Thank you, Nancy. Let's switch now to Chip Reid who is at the White House. Chip, what's the reaction been there? CHIP REID: Well, I asked Robert Gibbs about it at today's White House briefing. I expected a fire-and-brimstone response, but instead he ratcheted down the anger. He said yes, of course, all Americans have the right to express their views passionately but not in a way that encourages violence. RODRIGUEZ: Of course, the heart of all this anger is the President's executive order on abortion, and, Chip, that's what he was dealing with today. REID: He did, Maggie, but with so much controversy swirling around the issue of abortion, he chose to deal with it quietly, behind closed doors. Yesterday's health care signing ceremony at the White House was a wild celebration. What a contrast to today's Oval Office signing of the executive order on abortion. Anti-abortion rights Democrats whose votes were crucial to passing the bill attended, but no press coverage was allowed, only a photo taken by the White House. It appears to be an attempt to avoid controversy as anti-abortion rights activists condemn the order as a worthless piece of paper. They insist the health care bill will allow federal funding of abortion. The White House disagrees. ROBERT GIBBS: It ensures that health care, the law the President signed yesterday, maintains the status quo. REID: Amid all the anger over health care reform, the President did get some good news today. A new CBS News poll conducted after Sunday's final vote shows that 42 percent now approve of the health care bill, a modest gain from 37 percent before the vote. And the President's approval rating on health care is now 47 percent, up from 41. But the poll also has some bad news – 62 percent say Republicans should continue to challenge the health care bill. Only 30 percent say the bill will make the health care system better [worse: 33%]. And a mere 16 percent say the bill will mostly help them; 35 percent say it will mostly hurt. Tomorrow, the President heads for Iowa where he'll continue selling health care reform, but we’ll also be watching to see if he tries to lower the temperature on this red hot debate. Maggie? RODRIGUEZ: Chip Reid at the White House tonight. Thank you, Chip. 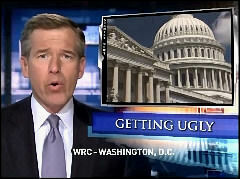 BRIAN WILLIAMS, IN OPENING TEASER: On our broadcast here tonight, it's getting ugly as anger over health care reform erupts into some over-the-top rhetoric, including threats now against members of Congress. WILLIAMS: Good evening. It can now be said that the debate over health care reform has gone too far. It's now veered into threats of violence, and tonight 10 Democrats who have been threatened are under increased security. The rise in tension and political division has been months, years in the making. Sunday's party-line vote in the House sent it over the top. What amounted to a huge victory for the White House was instead a rallying cry for the opposition. And today, there were calls to calm down the anger. We begin here tonight with NBC's Kelly O'Donnell on Capitol Hill. Kelly, good evening. KELLY O’DONNELL: Good evening, Brian. There is a sense of alarm here tonight, and there is caution about what should happen next. There are members of Congress who have requested extra security, and the U.S. Capitol Police tell us they have provided security briefings. Now, leaders of both parties are treading carefully, publically condemning threats and vandalism, but also not wanting to have attention encourage other attacks. STENY HOYER, HOUSE MAJORITY LEADER: We have been meeting with the Capitol Police and the FBI who are obviously concerned as well. O’DONNELL: That sobering assessment from top House Democrats today after at least ten members of Congress reported threatening incidents. They suspect the acts are politically motivated and linked to the House passage of health care reform. REPORTER TO HOYER: Do you feel that your members are really at risk in terms of their security? HOYER: Yes, I think we've had very serious incidents that have occurred over the last 48, 72 hours. O’DONNELL: From shattered glass blown out by a pellet gun at the Arizona district office of Democrat Gabrielle Giffords, to a brick thrown through a window at the New York office of Louise Slaughter. REP. LOUISE SLAUGHTER (D-NY): In Niagara Falls we had the FBI, the local police and the sheriff were all in there working together on it. O’DONNELL: Today at this Virginia home, a propane tank line was found severed. Congressman Tom Perriello's brother lives there. That address had reportedly been posted on a conservative activist Web site with a message to drop by. Democrats accuse Republicans of stirring a hostile mood and connect that to tactics used by Republicans to slow things down in the Senate today. SENATOR JIM WEBB (D-VA): The process that got us here has been ugly. SENATOR TOM HARKIN (D-IA): There’s no more than an attempt to stop and kill this reconciliation bill, and we can't allow that to happen. O’DONNELL: Republicans offered dozens of amendments, trying to derail a final package of fixes to the health care reform law and accuse Democrats of ignoring the public. SENATOR JUDD GREGG (R-NH): The arrogance is palpable – palpable – and inexcusable. O’DONNELL: Political anger and frustration on vivid display, in ways both civilized and over the line. Kelly O'donnell, NBC News, the Capitol. SAVANNAH GUTHRIE: This is Savannah Guthrie at the White House where the President's spokesman said passionate views over health care shouldn't turn violent. ROBERT GIBBS: We ought to exercise those views, not in a way that threatens anybody's safety or security, not in any way that foments violence. SENATOR ARLEN SPECTER (D-PA): Wait a minute! Wait a minute! CLIP OF PROTESTERS: Kill the bill! GUTHRIE: -and the fault lines of a fundamental philosophical divide – how big government should be and how involved in people's lives. The backdrop of Wall Street bailouts and main street suffering only sharpening the break. JEFF SHESOL, FORMER CLINTON SPEECHWRITER: This is an argument that goes all the way back to the founding of the country. And during times of economic distress, this argument, which is always simmering, explodes. We saw it in the1930s, and we’re seeing it again today. GUTHRIE: Wrapped around the brick that smashed the door of Democratic party headquarters in Rochester, New York, a note with the Barry Goldwater quote: "Extremism in defense of liberty is no vice.” On Twitter, former Alaska Governor Sarah Palin told followers, "Don't retreat, reload.” While an Alabama man advocated armed uprising. MIKE VANDERBOEGH, FORMER ALABAMA CONSTITUTIONAL MILITIA LEADER: The muzzles of three million rifles who can be – if required – pointed directly at the hearts of anyone who wants to be a tyrant in this country. GUTHRIE: At a conservative Tea Party protest at the Capitol this weekend, some demonstrators hurled racially and sexually-charged insults at members of the Congress. Appearing on MSNBC, former Bush White House advisor Karl Rove suggested these are the growing pains of a burgeoning political movement. KARL ROVE: Sometimes their rhetoric is raw and angry, and that's the down side. The up side is, is that a large number of people have been spectators have been motivated by a deep concern about our country to get involved in politics. GUTHRIE: Well, speaking of divisive social issues, the President today signed an executive order designed to prove and show that the new health care law does not allow for federal funding of abortion. That was key to that last-minute deal with anti-abortion Democrats that put health care reform over the line.